On March 11, 2011, the northern and central Japanese regions of Tohoku, Nagano, and Kanto were struck by a magnitude 9.0 earthquake accompanied by devastating tsunamis. Needless to say, the J1 and J2 seasons were placed on hold. After much deliberation the powers at be from the Japan Football Association and the J League decided for both divisions to resume play April 23, 2011. All teams and players were greatly affected by this tragedy. Six weeks have gone by with only two games having been played for the new season. Osaka hosted a game of J League All Stars (Team As One) v. The Japanese National Team on March 29, 2011. This game was a reminder of how deeply affected and moved the League and country had become because of this tragedy. Both divisions had teams affected with stadium damage such as Kashima Antlers, Velgata Sendai, Montedio Yamagata, and Mito Hollyhock. But this has not stopped them from playing football. Tourism is extremely important for Japan, and going to the country to visit is as good a time as any. Japan is safe and the portion of the country severely affected by the earthquake and tsunami is tiny compared to the rest of the nation. Do not be afraid to travel to Japan. Soccer has begun again with Japan on the road to recovery. This piece focuses on Tokyo but each team in the J League represents a piece of Japan anyone can visit and enjoy. The city of Tokyo is one of the most dynamic and exciting cities on the planet. This is by no means an exaggeration. The city hums with vibrancy unparalleled anywhere in the world. Tokyo contains all the vices and virtues which travelers look for in a city. It has your bars and pubs, your entertainment districts, (for foreigners and locals alike) as well as your museums and cultural hubs for those looking for more of an uplifting experience. Night life and day life are sublimely different. You can pack your day moving around the expanse of the city visiting restaurants and café’s, museums and parks; then by night you can visit theatre, dance clubs, 'adult' palaces, or check out the views from many of the highest floors of some of Tokyo’s largest buildings, not to mention the Tokyo Tower itself. You can never be bored in Tokyo, whatever you’re into. If you like sport then Tokyo is a perfect match. Tokyoites are heavily into different types of sports and sporting events. Traditional sports such as sumo have deep roots in this area of Japan, and stretch as far west as Osaka and Kyoto. But after the Occupation of 1945 by American forces more modern sport gained wider attention. Baseball is the predominant sport in Japan which runs through all areas of Japanese sporting culture, as it is played by all ages throughout grade school, high school and into University. Along with baseball; soccer has slowly begun to shape itself into a sport widely played throughout Japan. This began to occur in the 1970’s and 1980’s, but did not really shape itself as a force until the formation of the J League (Japan League) in 1992. The J League is divided into two divisions, the J1 and the J2. Tokyo has two teams which compete in J2, with FC Tokyo competing in the second division for only its second time since forming in 1999. Tokyo teams are FC Tokyo and Tokyo Verdy 1969. As stated above, FC Tokyo was formed in 1999 from Tokyo Gas FC a power company which was the main sponsor of the team from 1935 to 1999 changing their name to FC Tokyo when joining the J League in ‘99. Tokyo Gas was one of the original teams in the old Japan Football League which folded in 1998. FCT has had its ups and downs throughout its years in the J League, but sports some of the most vocal fans in the league. Tokyo being the capital of Japan, it is only natural that the fans demand the best out of their side. FCT have never won the league title but have won the Yamazaki Nabisco Cup (a yearly cup competition currently involving 14 clubs from J1) twice in 2004 and 2009. The team had its worse performance in 2010 when it was relegated to J2 on the final day of competition, finishing 16th. 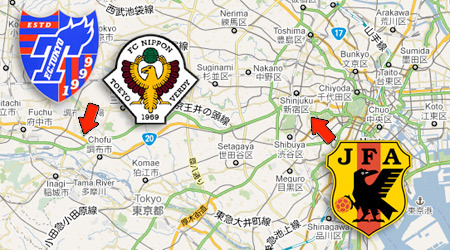 Tokyo Verdy 1969 has a larger and richer history which belies its success on the pitch. Yomiuri Verdy began in 1969 owned by the Yomiuri media company. Verdy continued strong corporate support throughout the 1970’s and was heavily involved in the Japan Soccer League, winning the league cup in 1979. Yomiuri was the corporate company name of the club much like that of FC Tokyo and others involved in the Japan Soccer league ie. Fujitsu turning into Kawasaki Frontale; and Kyoto Shiko Club into Kyoto Purple Sanga. When the Japan Soccer League disbanded in 1992 Yomiuri Verdy changed its name to Verdy Kawasaki, becoming professionalized but remaining in Kawasaki in Kanagawa prefecture. The team was hugely successful and won the first two J League championships in 1993 and 1994 respectively, as well as three Nabisco cups. Verdy eventually began to falter under corporate mismanagement and moved to Tokyo in 2000, causing a negative feeling with FC Tokyo fans ever since. Since 2000 the team has floundered up and down from J2 to J1 and back again, almost being dissolved as a team 2009. The team surprisingly finished 5th in J2 in 2010. 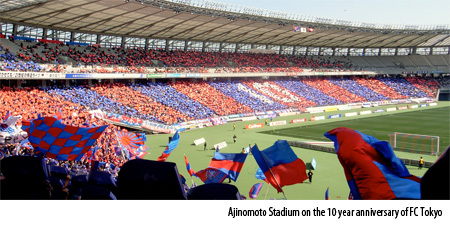 Both FC Tokyo and Verdy 1969 play at Ajinomoto Stadium which sits 50,100 people comfortably. It is located outside of Tokyo in Chofu City. It is fairly easy to reach from Shinjuku station on the Keio Line. You need to transfer trains at Meidamaie Station to Chofu where you transfer once again to Tobitakyu. In order to switch lines from Shinjuku station into the Keio Line station you would benefit from getting a Suica Pasco Pass from any of the friendly employees or subway/train electronic boxes at major stations in Tokyo. This is a prepaid pass you put cash on and reload at any time. It saves time and headaches. Getting off at Tobitakyu station you follow the throngs outside. Once you get out of the station you can stop off at any of the FC Tokyo shops scattered around the station. One is to the right exit and you need to climb up some stairs to get there, it’s to the right of the McDonalds. To the left of the station outside of the tracks is “The Shack” which sells LA12 (one of the FC Tokyo supporters groups) merchandise. I would highly recommend purchasing items from this gentleman because he makes some of the best bootleg shirts and FC Tokyo memorabilia which captures the moment of wherever the team or the city is during your visit. For instance he made Tokyo 2012 FC Tokyo shirts when Tokyo was waiting on the decision of whether it was going to get the 2012 Olympics. Many of these are one of a kind and when they’re gone, they’re gone.